Total Loss Car Claim Class Action Investigation - Shamis & Gentile P.A. Total loss car claim insurance payouts may not always reflect the full replacement cost when a vehicle has been totaled, according to class action lawsuits. These lawsuits allege that insurers violate their own contracts when they fail to reimburse policyholders for tax and licensing fees once a damaged vehicle has been declared a total loss. Depending on the age, make and model of the vehicle in question, these fees can add up to hundreds, even thousands of dollars. Contrary to common perception, a “totaled” vehicle is not necessarily beyond repair. When an insurance adjuster declares a damaged vehicle to be a “total loss car,” it simply means that he or she has determined that it will be more cost effective for the insurance company to simply replace it as opposed to having it repaired. At that point, the claimant should be entitled to compensation for the value of the total car. But in some states, the law requires insurance companies to pay even more. These states recognize that the owner of a totaled car should not be on the hook for other necessary expenses related to their claim, such as taxes and title transfer fees. Plaintiffs in total loss car claim class action lawsuits against insurance companies argue that tax and license fees are part of a vehicle’s replacement costs and that claims should be paid accordingly. In one recent Total Loss Car Claim lawsuit in Florida, a plaintiff alleged GEICO failed to pay such fees on a leased vehicle that was destroyed in a crash. GEICO tried arguing the policy doesn’t cover such fees on a leased vehicle, only on an owned vehicle. The judge found that on the contrary, GEICO’s policy makes it clear that owned and leased vehicles will be treated the same. Plus, Florida law dictates that if an insurance policy is ambiguous, the matter should be interpreted in the insured party’s favor. The definition to determine whether or not a vehicle is totaled in an accident is usually different in each state. Roughly, if the damage to the vehicle is more than 70 to 80 percent of the vehicle’s actual cash value, the vehicle is totaled. A common myth is if an airbag deploys in an accident, the car is always totaled. In many accidents in which airbags deploy, the vehicles are totaled. One reason is that an airbag can cost more than $1,000 to replace in most cars, so if an older vehicle has an airbag deploy, that extra $1,000 cost can affect the math, causing the vehicle to be totaled. For example, if John Smith carries comprehensive insurance on his 10-year-old Toyota pickup truck that releases an airbag as she hits an elk on the freeway, her truck might be repairable, but still totaled. If the cost to replace the airbag combined with the front-end damage to the truck equals more than the actual cash value of the truck, the insurance company will total the truck. An insurance adjuster will evaluate the crash and the damage to your insured vehicle. 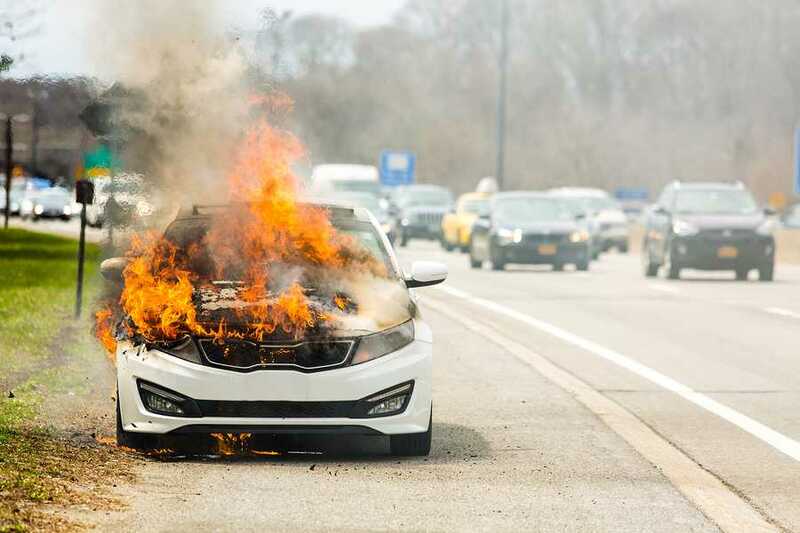 The accumulated information is usually run through specialized computer software that determines whether or not the vehicle is a total loss. The amount of money provided to the owner of a totaled vehicle, according to most insurance policies, should include sales tax and title transfer fees. If those monies are not provided in the total loss car claim calculation, the consumer may be able to seek legal assistance for breach of contract. If a vehicle is considered a total loss, the owner will not receive the amount of money they originally paid for the car. Some inexperienced drivers are shocked to discover how much their cars have depreciated since they bought them. A vehicle that is totaled, but is still not paid off, can leave the owner with extra financial pressure when having to replace their total loss vehicle. Some insurance companies offer gap protection, an extra level of insurance that covers the difference between the settlement amount on a totaled vehicle and what is owed on the vehicle. Numerous other insurers have faced lawsuits over failing to act in good faith with their insureds. Over a decade ago, the American Association for Justice issued a report ranking Allstate as the “worst insurer for consumers,” citing its “Deny, Delay, Defend” strategy used to avoid paying the full value of claims. In 1997, State Farm was forced to pay over half a million to a family who alleged bad faith on part of the insurer. If you were insured under an auto insurance policy, experienced a total loss car accident, and were not reimbursed for sales tax and other fees by your insurance company in the last 5 years, you may qualify to join a total loss car accident class action lawsuit investigation. Contact Shamis & Gentile, P.A. or fill out a contact us form to join a total loss car claim class action lawsuit investigation.